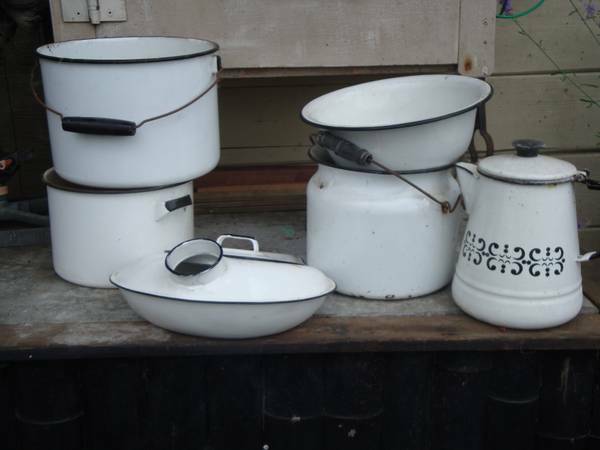 Six lovely pieces, and yes – that is a bedpan (never used, in pristine condition), hospital issue from between the wars. In a follow-up to yesterday’s outhouse post, I am plotting a small project for the winter workshop which will see the creation of a wash-basin stand. For the stand I intend to simply cut a hole in a piece of wood to rest a basin in, sand, stain and varnish – and then later in the summer attach it to some legs cut from trees on our property. When I first envisioned this, I determined that for the basin I would like to find a piece of vintage-looking *or* actual antique enamelware. It didn’t have to be in great shape since its sole purpose will be to hold water, so I figured I could find something pretty cheap. But looking in local antique shops here and in the interior had turned up nothing. ← Outhouse pictures and update.